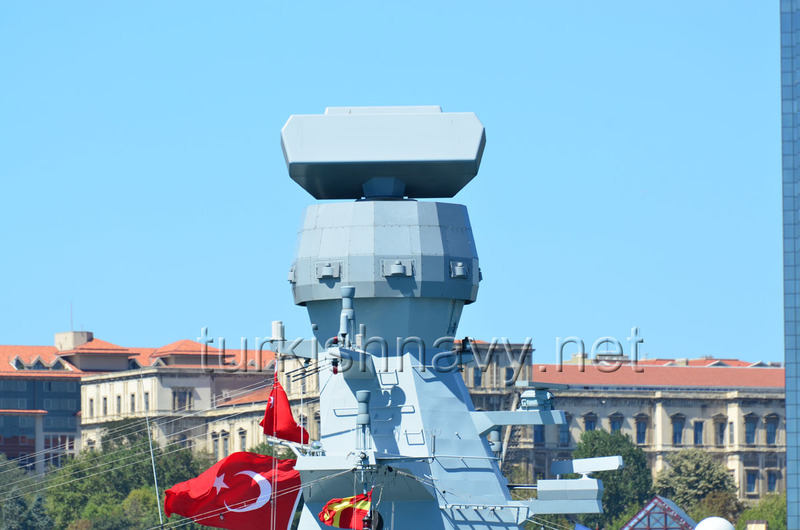 5 ARES-2N EW antennas can be seen below the SMART-S Mk2 3D radar on the mast of TCG Heybeliada. Turkish military electronic company Aselsan was chosen to supply ARES-2SC electronic support measures system for the Agosto 90B submarines in Pakistan Navy, according to IHS Jane’s. ARES family of ESM systems are developed by Aselsan to be used both on surface ships and on submarines. The ARES ESM system detects, intercepts, identifies, classifies, tracks, direction-finds (DF), localizes, platform correlates, records and provides audio warnings of threat signals within the 2 to 18 GHz frequency band. ARES-2N is integrated into Turkish Ada class corvettes and the ARES-2NS, especially for submarines, is fitted to the 2 modernized Ay class submarines. This system is also selected for the Reis (Type 214) class submarines. The main difference between ARES-2N and ARES-2NS is, that the latter has smaller antennas and a single operator console due to the limited space available on submarines. The system on Pakistan submarines will be the second generation ARES-2SC that has a dedicated ESM mast antenna, as well as a separate omnidirectional radar warning receiver (RWR) antenna designed for installation on periscopes. Aselsan officials Told Jane’s during Indodefence 2016, that the company has recently been selected to provide the ARES-2SC system as part of the upgrade of the Pakistan Navy’s Agosta 90B submarines. In this case, it will give the main ESM to STM (as prime contractor), while it will separately supply the periscope-mounted RWR antenna to Airbus DS Optronics for mounting on a new search periscope. TURKISH ELECTRONIC COMPANY HELP TO REPAIR PAKISTANI SUBMARINES. I think the Agosta-90B upgrade will essentially be the same or near enough the same as the one for the Ay Class. A shame they didn’t fit the upgraded Ay Class submarines with AIP though. That would have been very interesting.